Isaac Brynjegard-Bialik: Nice Jewish Artist: Justice; justice you shall pursue! Justice; justice you shall pursue! Earlier this year I completed a large commission that I mean to share out here in the blogosphere, but never did... so here it is! It was for a lawyer commissioned by his wife as a surprise gift marking 30 years in his own practice. And since we're all friends out here, I will tell you his name is Barry (that'll be relevant at a certain point). In the Book of Amos we read the words, “Let justice roll down like a river, and righteousness like a never-failing stream” (Amos 5:24). The verse brings to mind a waterfall, with justice rolling down from above and spreading out in abundance in all directions on the earth. To represent Barry’s commitment to justice — to a life dedicated to ensuring it flows to all — I have created a papercut waterfall, with water cascading down and expanding in whirls and swirls. 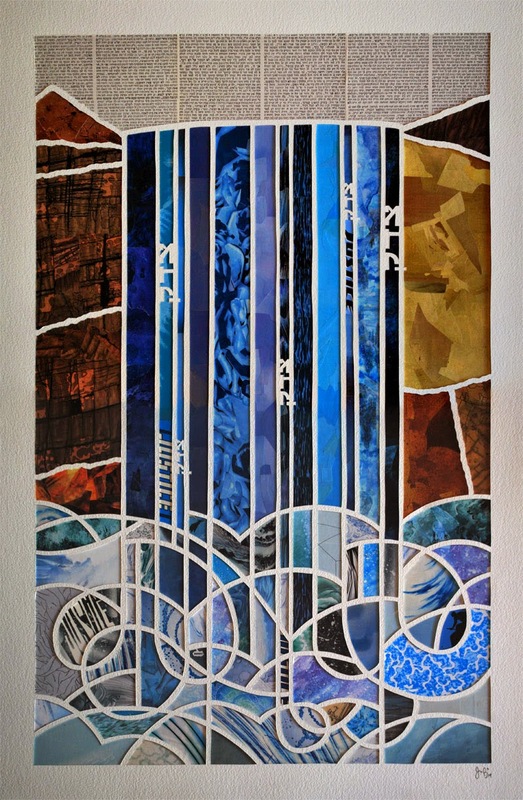 In the falling water are multiple instances of the Hebrew word for justice, tzedek, which also brings to mind the words in Deuteronomy which tell us, tzedek tzedek tirdof: “justice; justice you shall pursue.” At the top of the papercut, the source of this justice is seen in cut-up sections from Rashi’s commentaries on two relevant sections of the Torah: Shemot (Exodus) 20, which includes the ten commandments, and Vayikra (Leviticus) 19, which is known as the Holiness Code, and addresses the legal details of fair wages and employment as understood by our sages (Barry's particular areas of focus). The papercut is backed with cut-up comics featuring the Justice League and Justice Society (most noticeable in the words “justice” placed behind the falling water) and Daredevil — a lawyer by day and costumed superhero by night, bringing justice to those that cannot find it in the legal system. It's is Barry's firm sense of ethics that I am representing through the heroes of these comics — who respect the law, but even more seek the justice it promises. There are also some pieces from Flash comics, whose titular hero’s alter ego also serves the law and is known to his friends as Barry (see? told you it would be relevant).